Ramblings, rants, gardenish nonsense and cineastic idiocy with Nigel Colborn. IT IS A DECEASED BLOG. Oh dearie me - another embarrassing gap between posts. Please forgive. I posted these pictures a couple of weeks ago because I had intended to rant about politicians, celebrities and public figures who began piously to wear Haig Fund charity poppies several weeks before Armistice Day or Remembrance Sunday. I can't understand why I found such low key demonstrations of personal worthiness so offensive but the whole thing put me off wearing a poppy at all, this year. It seemed as though there was a contest of some kind, to show who cared most about the millions of young lives thrown away because of awful policies, mostly devised by old men. And with people still dying in unnecessary wars or at the hands tyrants, the whole idea of remembrance seemed to me to have become cheapened by turning the poppy into some kind of uniform or a badge of virtue. Then, after reading Robert Fisk in the Independent and Harry Leslie Smith in the Guardian I realised that there were far bigger minds than mine reacting to such behaviour. 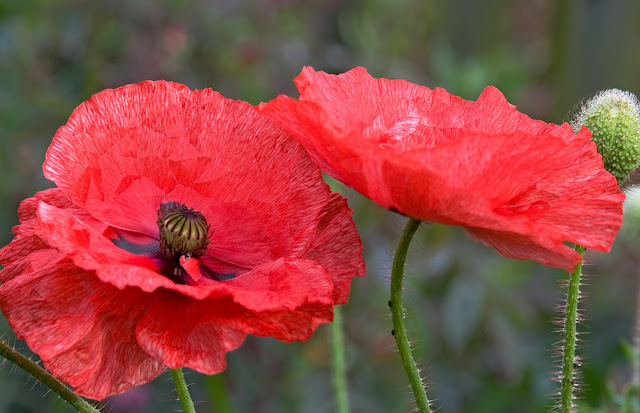 And when, by mistake, I tuned to that puerile television dancing contest on the BBC, last month, I noticed that absolutely everyone wore poppies of one kind or another. Some even appeared to have small red enamel and gold ones. How distressing, to link chic items of costume jewelry with more than a million boys and young men who died hideously and agonisingly in Flanders where Papaver rhoeas happened to grow in the shell-ravaged battlefields. 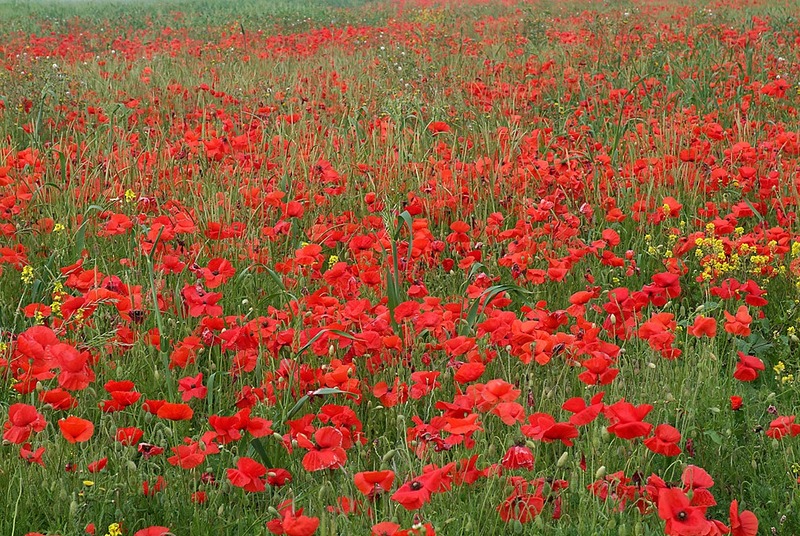 That November badge – cheap plastic imitation of a field poppy – has become even cheaper and shoddier. In future, I'll still make an annual donation to the British Legion but won't be wearing a buttonhole. 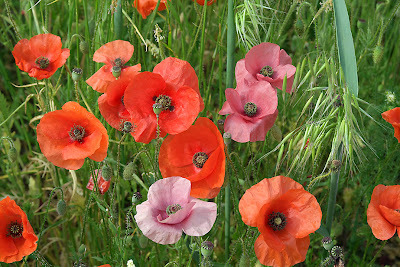 Natural variation, spotted in a field of poppies. 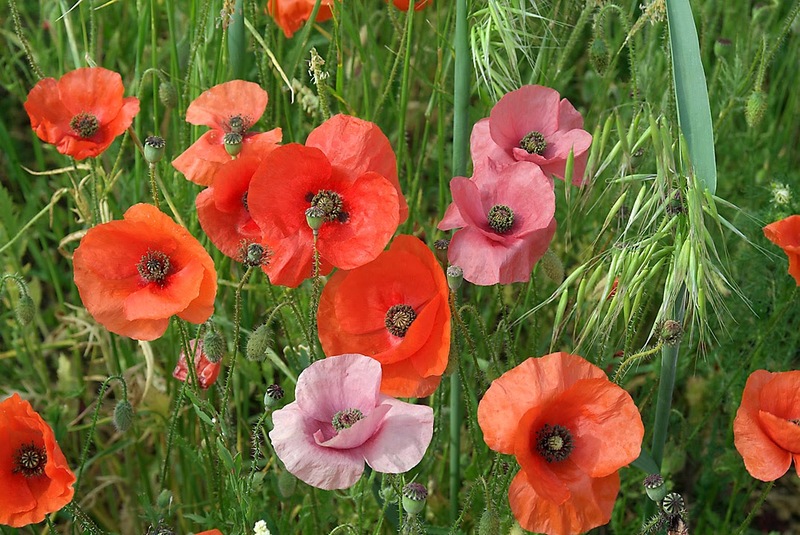 The poppy itself could never be besmirched. 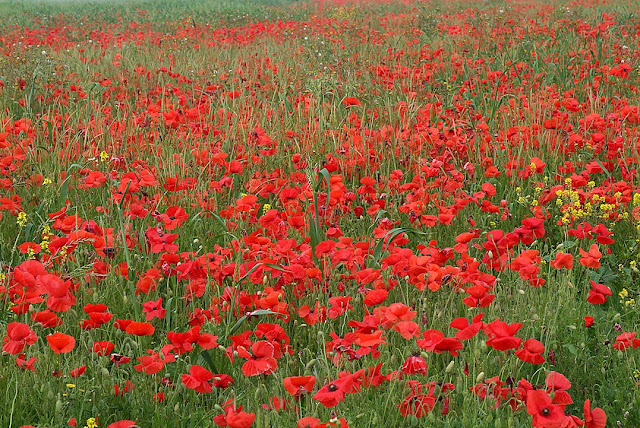 Such peerless beauty is everlasting and one of the great delights of the summer is to see the poppies, individually at first – a scarlet roadside flash – and then in profusion. It's difficult to analyse that beauty. 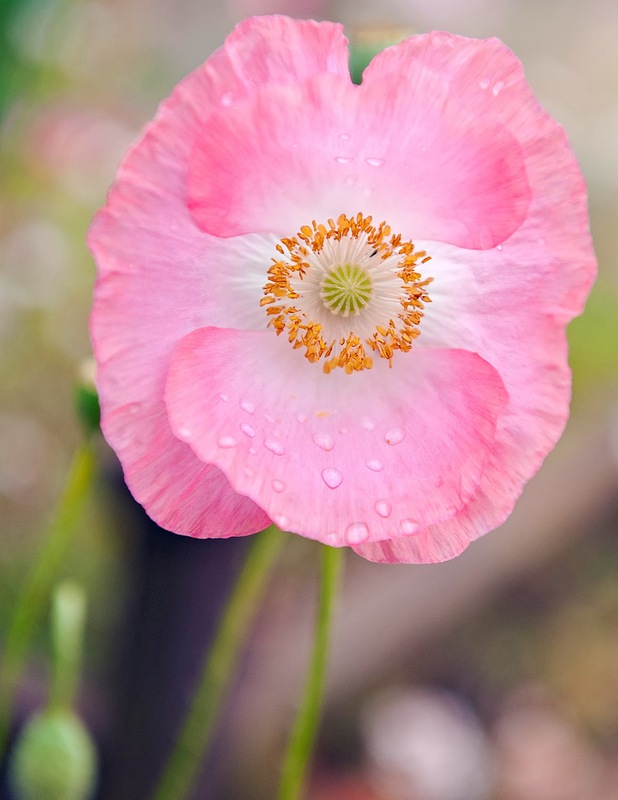 Is it the pleated petals, pressure-packed like a tiny parachute in the gooseberry-haired bud? Is it the rapid expansion, like a butterfly from its pupa, from wrinkled blob to silken perfection? Or is it that the flowers don't really fade. They emerge, they're fresh and lovely, they fall. 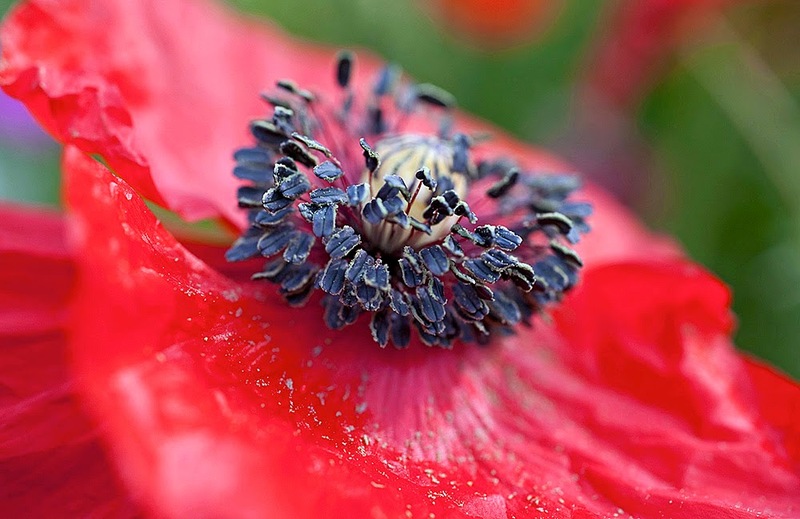 A true Shirley Poppy, with yellow stamens. 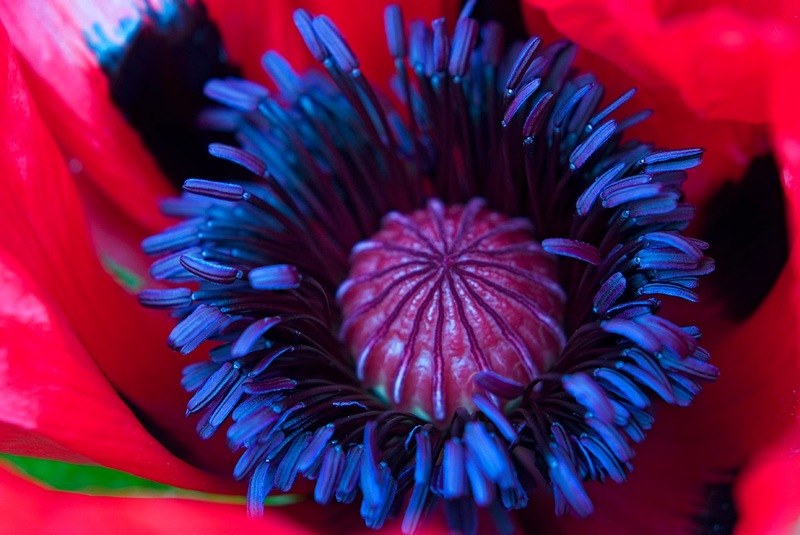 Stamens. How many flowers have dark grey ones? An unlikely blue tinge on Papaver 'Beauty of Livermere' It's a perennial, probably just a good form of Papaver bracteatum. 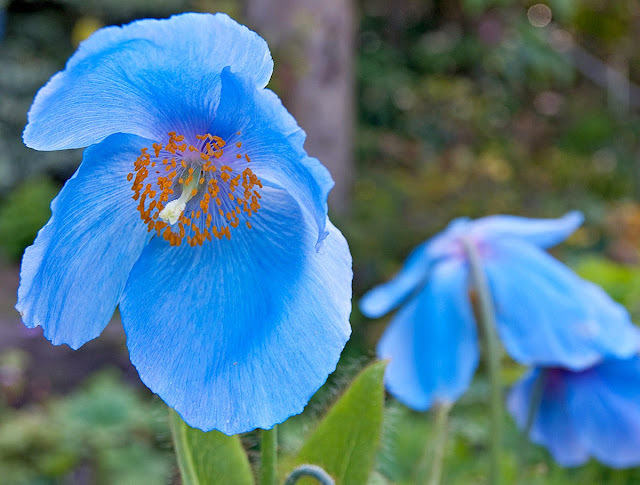 Meconopsis are wonderful, too, but they lack the charm of the big, pepperpot central capsule. 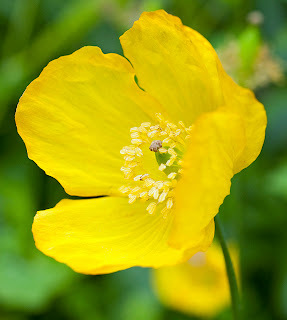 There's nothing better, for cool shade or semi-shade, though, than a stand of Welsh poppies. And finally - a Himalayan blue job. I think it's 'Branklyn' but a meconopsis of one sort or another. I'm listening to Benjamin Britten's Friday Afternoons, song arrangements for children. It being the great man's centenary, I'm working through my collection. Grimes is being saved until last. This week's exciting event was the Garden Media Guild Awards Lunch. Everyone was extremely jolly and the food was delicious. Awards were presented. We consumed six cockles each among other things as an appetizer and ate blue-grey potatoes with tender lamb, followed by a tiny tarte tatin. That's it for now. Bye bye. From time to time, between more general posts, I'll be publishing selected extracts from my diary which may be of general interest. The text has been edited, to remove personal or private material and to avoid offence where it is not intended. Accompanying pictures, as always, may be relevant but are more likely to be included just for relief from the awful prose. A storm builds over the North Sea at Holkham Bay in early August 2013. Is a storm gathering over food supply versus sustainability in Britain? 21st August 2013, at home. After lunch, the PG and I walked the fields above the Fen. It was what Norfolk countrymen would call a 'fine, soft day' with pearly sky, gently filtered sunlight and exactly the right level of warmth. Much of the wheat is newly harvested. Land is cleared within hours of the huge, high-tech combines feeding their way into the crop. Straw was processed into big bales – not for bedding or fodder, I suspect, but for bio-mass fuel to feed power stations. The baler follows the combine; fork-lifts and trailers follow the baler and within 24 hours a 50 acre field is cropped, cleared and part-way tilled with heavy disc harrows or a spring-tine drag. Where land is worked, gigantic half-track or double-wheel tractors pull tine-disc combinations, sometimes turning stubble to drillable tilth in a single pass. I'm reminded of H G Wells' 'Land Ironclads' – though those were military tanks. The land is bludgeoned into submission by these mechanical giants whose size makes their drivers look like little plastic toys . The romance is gone from arable agriculture. No mammals – short tailed voles, harvest mice, field mice – will pick through stubbles which are left for less than a day. Few farmland birds will forage for grain fragments. Arable weeds – if they germinate at all – will be zapped with residual herbicides and a rushed treatment with slug pellets – probably methiocarb – deals with the molluscs. Thus, the rich fenland, east of the village, becomes more barren than a desert. Kestrels, buzzards and barn owls, though they survive here, have slim pickings and the only refuge from machines lies in the narrow field margins, occasional trees and the few dyke-sides or road verges which have not been mown. Considerably more than four tonnes of milling wheat can be harvested from each tilled acre, here – more than double the national average for when I farmed in the 1970s. In real terms, the price of the grain has not increased by much, so arable farmers need those big yields to stay profitable. But on such bountiful land, do they need generous taxpayer subsidies? The payments are for 'land stewardship' we're told – but little or nothing is done to protect the varied habitats surrounding the intensive cropping. Thus, by default, biodiversity is reduced. And even where there are extra stewardship schemes, also paid for by taxpayers, biodiversity can be almost as poor. I don't think this damage is caused by wantonness or spite. As with so many cases of unnecessary damage, ignorance is the main cause. With learning, better understanding of how the natural world works and small, low-cost – or even cost-free – changes in many common farming practices, biodiversity could be sustained and enriched – and without yield loss. With that kind of care, the beauty of these flatlands would be spectacularly enhanced. But in spite of everything, our Fen does not lose all its beauty. 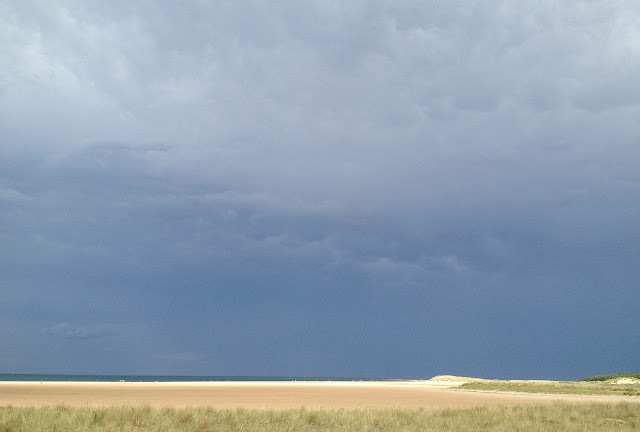 It remains a place to be cherished for its calming flatness, big skies, constantly changing light, moody water courses, low-level mists, rampaging thunder storms – even for its keening, penetrating winter winds. That is so even as, day by day, month by month, a little more life-richness is lost. Plink, plink, plink – one by one the lights of life go out, the bulbs fuse, the filament snaps, a fairy dies. With land ownership – whatever the acreage – comes a deep and binding responsibility, not just for now but for coming generations. And that applies to those of us who garden, as well as to big arable farmers. This is not about saving bitterns or re-introducing ospreys; it is not about grants for planting pointless hedges or digging isolated ponds. This is about teaching everyone in the countryside how to live and let live – that is, to let the rest of life on earth live. At a guess, I'd say that biodiversity is greater, now, in Peterborough than on the fenland which surrounds that sprawling city. And yet, 200 years ago, the lowlands of Eastern England had some of the richest and most diverse habitats in the British Isles. How on earth did we allow that to happen? 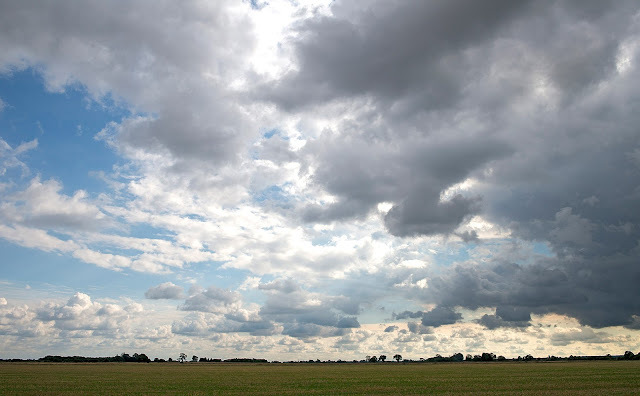 BIG SKIES: part of our fen, at the end of the settled weather period in early September. A disturbing and distressing story caught my eye in this fortnight’s Horticulture Week. Brussels Bureaucrats, apparently, are about to smack us about the head with a particularly ill-judged and potentially damaging piece of looney-toons legislation. Believe me, this one makes the outlawing of curved bananas look sane and reasonable. As part of proposed EU legislation to regulate ‘plant reproductive material,’ Brussels wants all plant varieties to be listed on an official register. To implement that, they want every variety to carry an officially recognized description which could run to two pages. Such descriptions would give details of such life-threatening features as the length of the hairs on a plant’s stems. This would be part of a plan to force nurseries and individuals to sell only registered plants. Registration, because of the exhaustive information required, multiplied up by all the red tape necessary to keep the maximum number of EU civil servants employed, will cost a great deal of money to implement. And presumably, each registration will have to be approved by the Eurocrats. It could therefore become illegal for anyone to sell non-registered plants. This system already applies to vegetable and agricultural crops, greatly reducing diversity. We do NOT want this to happen to ornamentals – preferably not anywhere but absolutely NOT UNDER ANY CIRCUMSTANCES in Britain. 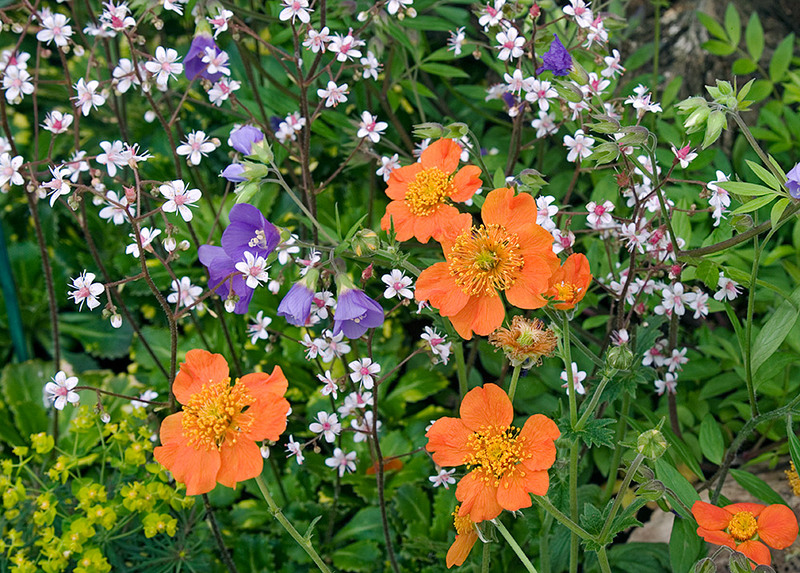 British gardens are among the world's most diversely planted. How many of these modest plants might be lost, if registration becomes necessary? Would registration condemn them? If this legislation is forced through, it will kill small, independent nurseries – the lifeblood of British horticulture and the main reason for our unique horticultural diversity. How many other nations can boast more than 70,000 cultivars and species commercially available? Holland? I don’t think so! Dotty legislation like this could also clobber plant breeders. The big guys may be able to carry the cost burden, not to mention the mind-numbing paperwork, but the little chaps? No chance! Professional and semi-professional breeders have given us so much in the past. I’m talking about people who tinker with specialist plant groups, often in back garden nurseries. They have bequeathed British – and therefore world – horticulture some wonderful varieties. You may remember Woodfield Brothers’ spectacular lupin exhibits at Chelsea year after year, back in the, er, 1990s. 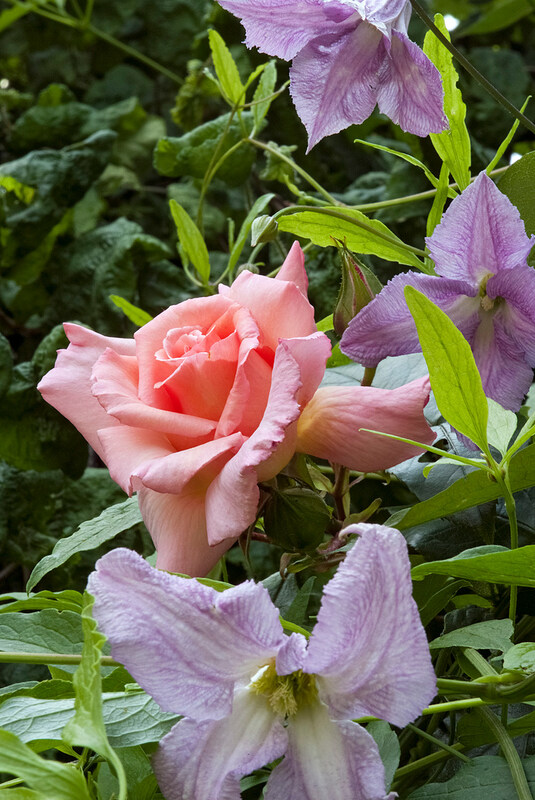 Many of us still grow the late Hector Harrison’s fascinating diascias. And what about Elizabeth Strangman’s pioneering work on hellebores? 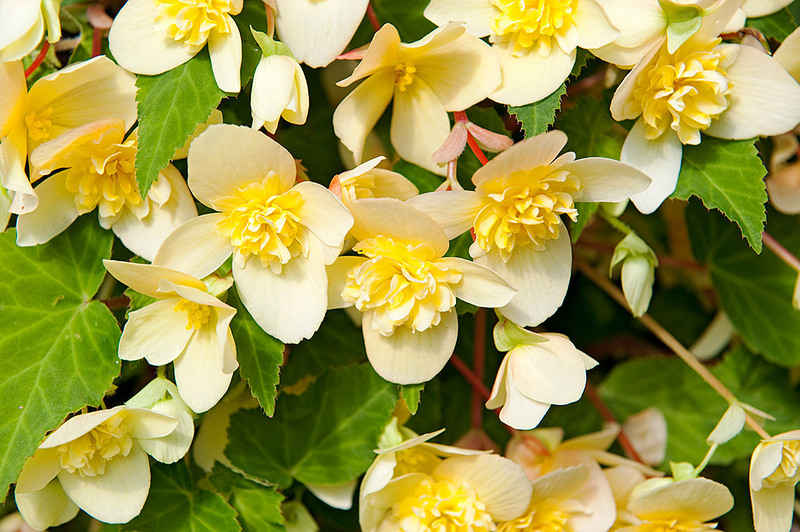 Think of amateur and semi-professional dahlia breeders, too, not to mention iris nuts, saxifrage enthusiasts, fuchsia breeders – the list is long and diverse. 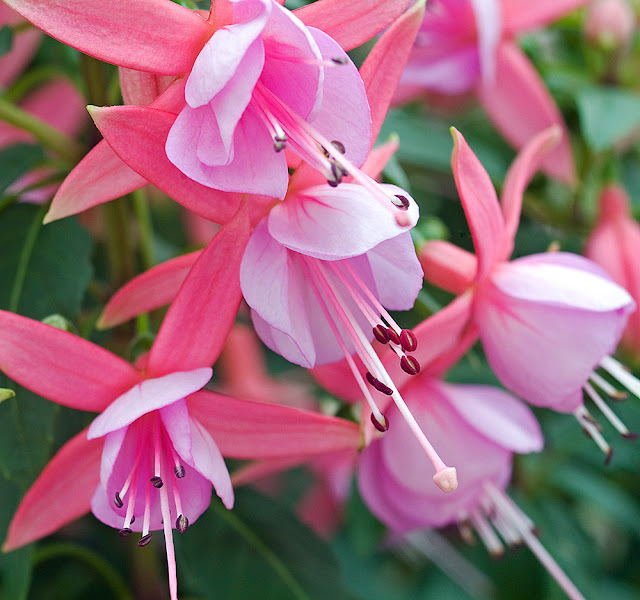 Fuchsia 'Rose Fantasia' Fuchsia enthusiasts have raised thousands of cultivars. If each has to be registered, most could be lost to cultivation. So what happens if those unelected Brussels Sprouts have their way? What will that mean for the diversity of planting in good gardens? Do we really want our planting schemes limited to what is approved for registration by those self-perpetuating grey scrubbers? Currently, anyone can offer plants that they've bred - either to give away or to sell. Many are also happy to let their progeny go into cultivation without protecting their intellectual property, ie, without breeders' rights of any kind. I love that kind of freedom. It is part of our gardening heritage, just as it is also reasonable that professional breeders should have the right to protect or copyright their commercial progeny. 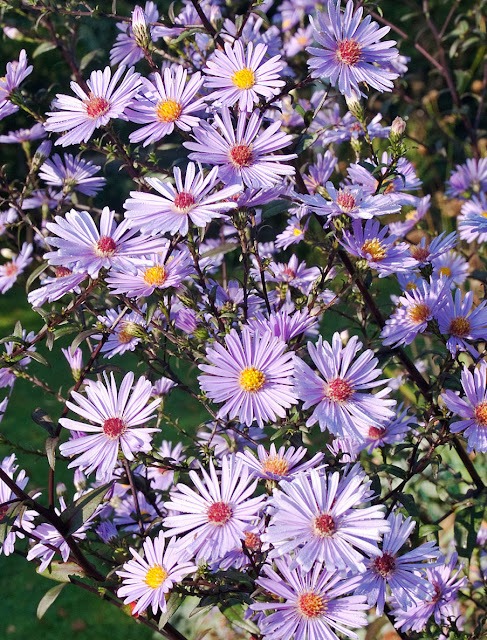 Let’s say, for example, that a perennial enthusiast has developed a gorgeous late flowering aster, with bright, rosy-purple flowers and elegant, darkly marbled foliage which is never disfigured with so much as a speck of mildew? Most British gardeners might give it little more than a cursory glance. So if big horticultural marketeers fail to see any potential, that plant is overlooked, no one registers it, so good-bye! The Begonia 'Sherbet Bon Bon' – a highly commerical plant. Great, but I want esoteric, wispy things in my garden as well as big brassy jobs like this. So what will British growers, breeders, gardeners and in particular, plantsmen do? Will we fight such insane legislation, if it looks like becoming law? Will we march in the streets, waving placards? Will we distract our MPs from worrying about their emoluments and get them help us out of our miserable situation? And what will the Royal Horticultural Society do? Let's hope they're going to raise an almighty stink about this. If they don't, they dam' well should, and now and without ceasing until the nonsense is nipped in the bud. We know that DEFRA will probably be supine and continue to snooze gently while the legislation goes through. And probably, as gardeners, we’ll just moan a bit more, and then carry on muddling through, somehow. And in time, the less mainstream plants will quietly disappear. Or, they’ll be flogged, one at a time, at garden fêtes or from Women’s Institute stalls, or exchanged among garden clubs until, like Gardeners Delight tomatoes, they’ll become denatured, variable, of dubious provenance and no longer so desirable. In time, we could see our gardens – both public and private – lose their uniquely rich diversity and become drearily uniform. And this won't happen just from Penzance to Inverness, but also from Britain to Bulgaria. How bloody awful, to have one of our richest treasuries – our wonderful plant heritage – watered down to a few hundred crappy cultivars which look OK in garden centres but have limited garden value and are exactly the same, anyway, as what grows in every garden in the street and in every park as well. What a terrible thought! I hope I'll be digging in God's little acre, by the time that happens! 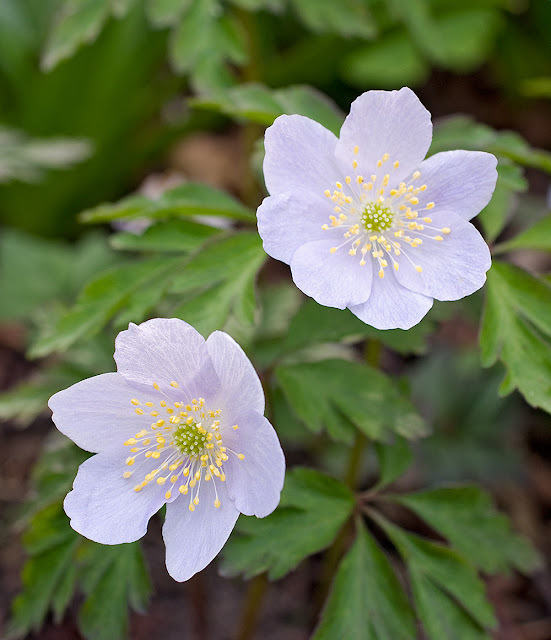 Anemone nemorosa 'Parlez-Vous' - a cultivar of quiet beauty, probably only of interest to a few gardeners. But I wouldn't be without it, or without a dozen other wood anemone cultivars. I'm listening to Benjamin Britten's extraordinarily bouncy-rhythmed festival cantata Rejoice in the Lamb. This week's film, in honour of the recent date was Battle of Britain. When released in 1969, this film was unkindly received. But it has lasted well and is a reasonably accurate telling of Britain's invasion crisis, in September 1940, averted by our gaining air supremacy over the Luftwaffe. Olivier's portrayal of Dowding was, for once, under-played and utterly convincing. Hang onto your fancy plants - the grey men are coming to get them! Sorry but, yes – yet another butterfly picture. But but he who tires of such darling winged jewels must surely be flyered of tife. Get yourself outdoors, now, while there are still a few on the wing and admire their co-ordinated colour schemes and the gliding flight that some of them manage. And what about those intricate, watch-spring probosces which coil and uncoil and can be inserted into the tiny Buddleia flowers with such alarming accuracy? Winter will be here soon enough and then we'll dream of butterflies. Some of us will long to see buddelias bloom again, and to enjoy their slightly cheap, Fry's Chocolate Creme fragrance. A-a-anyway . . .back to butterflies. 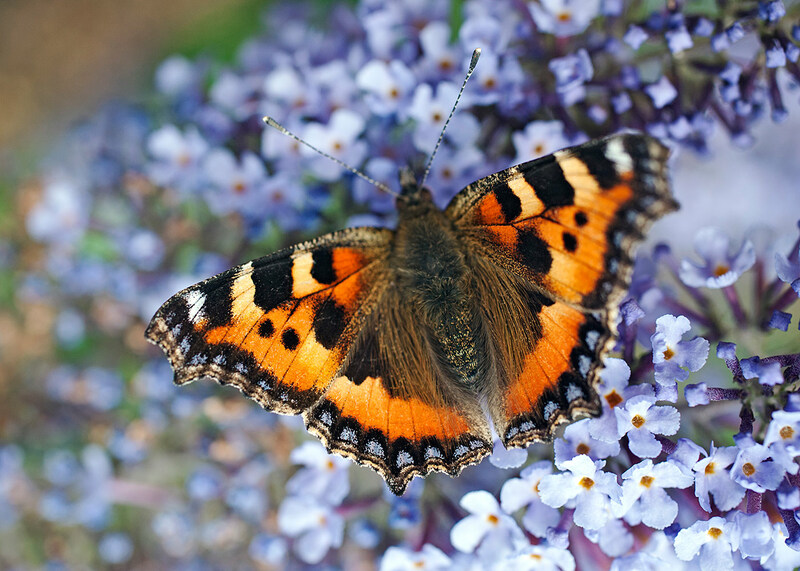 Like so many people on the look-out for nature, this summer, the PG and I have been bowled over time and again by so many joyous butterfly sightings that it seems wrong not to mention them again. 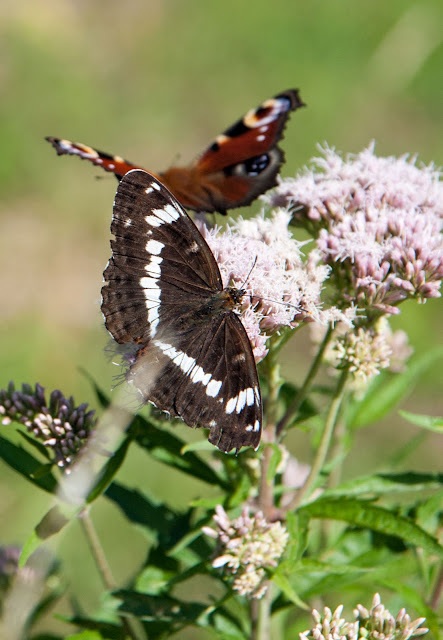 Stars for us, this year, were more White Admirals than I've seen in a lifetime; a Green Hairstreak, Clouded Yellows, Graylings and in our own mini-meadow – after missing them for a year – Common Blues of both sexes. We hope they've bred but have no idea whether there was any of the necessary hanky-panky. Also 'on the pin' in his collection, my brother showed me a number of aberrant Camberwell Beauties. These would have been caught, killed, set and then mounted in an insect cabinet. But that was in an earlier era when collecting Lepidoptera was a noble pursuit. How I would love to see that gorgeously cream-edged, purple beauty, Aglais antiopa, on the wing. One day, perhaps. feeding on hemp agrimony in Holkham Pinewoods, Norfolk, in early August. Butterflies punch above their weight, in the line of beauty. Few other insects cause the heart to sing so joyously – especially when one spots an unusual one. Some are herald insects, too. The year's first Orange Tip tells us that spring is truly come; Ringlets appear in the first week in July, usually when it's close and thundery; peacocks hang about my potting shed when autumn days lose their charm but fly out again, if the late sun coaxes. Most of us admire only the adult butterfly or imago but the pupa of a Peacock which hangs from its tail, is an object of intricate loveliness. And a Large White chrysalis, which props itself upright with a thin silk girdle attached to at vertical surface is also to be admired even though the caterpillar has probably ransacked your broccoli. A world without butterflies would be a hellish place. We should strive to preserve such vulnerable insects. The rose 'Compassion' and Clematis viticella 'Betty Corning,' both of which are fragrant and both of which produce flowers for much of the summer. These adorn the arch which leads into our tiny woodland garden. I'm listening to Neil Mackie singing Benjamin Britten's Serenade for Tenor, Horn and Strings. There are worse ways to enjoy Tennyson et al and the music is sublime – Barry Tuckwell is the fruity tooter. Here's a brief, unedited diary extract.